Mallet finger is the name for an injury that bends the tip of your finger downward, so you can no longer straighten it. It can happen to anyone when something hard, like a ball, hits the tip of their finger, forcing it to bend further than it would naturally. The force of this injury pulls or tears the tendon running along the top of your finger (the extensor tendon). As a result, you can't pull your finger straight again. How do I know if I have mallet finger? If you have mallet finger, your finger will droop, and will only straighten if you push it up with your other hand. It will probably be painful, swollen, and bruised. Your doctor will examine your finger, then hold it while they ask you to try to straighten it. You will probably have an X-ray to check whether you have broken a bone or the joint has been pulled out of alignment. Mallet finger is usually treated with a splint that holds your finger straight and lets the tendon, and sometimes a small piece of bone, heal. You need to wear the split for six weeks, to prevent your finger developing a permanent droop. While you're wearing the splint, it's important to take it off at least twice a day to wash and dry your finger thoroughly. Gather together what you need to dry and wash your finger before taking the splint off: tape, wet flannel, and towel. If your skin is getting moist and white looking, wiping it with surgical spirits may help to dry it. When the splint was first put on the hand therapist or nurse will have applied some white tape that helps to keep your finger straight while you have the splint off to clean your finger and dry it. They will also have shown you how to replace this tape when you need to. 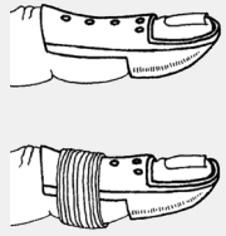 When sliding you finger back into the splint, make sure your finger is pushed into the end, and then retape it as the picture shows. Make sure the tape doesn't go over the second joint in your finger, as your finger will become stiff if this happens. After you have had your splint on for one week, you will have an appointment to check that it is fitting properly. It's not common to have surgery for mallet finger, but occasionally it is needed if the joint is out of alignment or there are large fragments of broken bone. In these cases a surgeon puts pins in to hold the pieces of bone together while they heal. Written by HealthInfo clinical advisers. Endorsed by orthopaedic surgeon, Canterbury DHB. Page created April 2017.